A wet basement is guaranteed to invite mold into your home. Preventing mold requires removing its source: moisture. 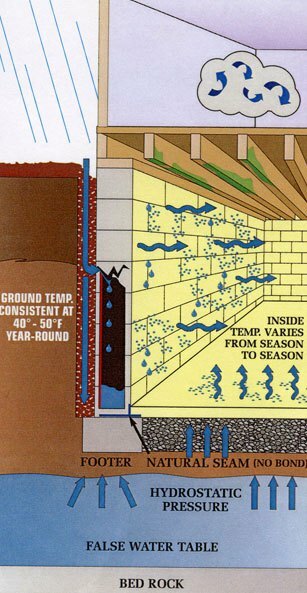 Without waterproofing your basement, simply removing mold will only be a temporary solution. It’s important to take mold seriously, as exposure to mold can be very hazardous to your health. "...mold cannot grow without access to moisture. The most effective way to treat mold is to immediately correct the underlying water damage and clean the affected area." Mold only needs 20% moisture to grow. If you see mold, mildew, or smell a musty odor, chances are that's only 10% of the total mold in your basement! As part of our basement waterproofing services, EverDry Toledo will locate and remove any sources of basement mold. Without water and dampness to grow, the mold will dry up die. As long as the source of moisture does not come back, neither will the mold. Complete waterproofing will stop mold from growing back or ever appearing in the first place. If your basement hasn’t been waterproofed yet, explore our basement waterproofing options online. One common issue is when the basement foundation is cracked or damaged, which lets water seep in that allows mold to thrive. Our high-pressure foundation crack injections can fix these problems quickly and easily. In some extreme cases, the foundation is too damaged for repair, and a foundation replacement is necessary. If you’re not sure which service you may need, contact us for a FREE 20-point inspection! EverDry Toledo also has a great selection of waterproofing products that can remove moisture from the air or prevent it from invading your basement in the first place! After the moisture source that is feeding the mold is removed, the mold will quickly die and become easier to clean. With a simple wire brush, scrape the mold off the surface until it’s completely removed. Then simply wash the surface with either a combination of bleach and water, or a household mold removal product, available from most hardware stores. Removing mold without waterproofing your basement won’t do any good. Even after you clean it, if the water source remains, the mold will come back. If you find new mold growth after waterproofing, it could mean there’s a new source of water.